In the dark gloom of January, when the mornings are still dark and icy and it is hard to drag ourselves out of the warm cocoons of our beds, it is difficult to think about the Rewards’ Trip in the summer. It is very easy to feel that winter is going to extend its vice-like grip for an eternity, especially with the mention of possible snowfall. However, before we know where we are it will be spring and then summer. The mornings will get lighter and warmer and it will be easier to get up and out of the house. By late May/early June Year 11 will have sat their exams, we will be in the fourth and final learning cycle of the year and we will be starting to work out who is eligible to go on the annual Rewards’ Trip. · An average effort grade of 3 or more on PS3. Last year, in consultation with students, we organised a trip to Thorpe Park, which was enjoyed by many students. This year we will again ask students where they would like to go and will take all possible steps to make this a reality. If you have any good ideas about where students may like to go, please do contact me at school. How does a student know if they are eligible? Students keep track of their attendance every week during tutor time where they record their attendance, punctuality, praise points and behaviour points so your child should know whether they are on track to attend this trip. As parents, you have the ClassCharts app which shows you the attendance and conduct data for your child. You also have the Praising Stars report which is issued 4 times a year. We will write to you in the first week back after the May half term and tell you if your child has met the criteria to go on the trip this year. If a student has a genuine medical appointment that cannot be arranged out of school hours, please provide us with a copy of the appointment letter. We will then ensure this does not count towards the attendance figure for this trip. We have also lowered the attendance target this year for the trip to 96% as we understand that sometimes students are ill and need to take some time off. The attitude we are trying to instil in students is to only take a day (or a morning!) off when it is really necessary and then come back as soon as possible. Attendance and success are intrinsically linked. Clearly, you cannot learn if you are not in school. We continue to link attendance figures to the attendance ladder so students know what this means in practice. 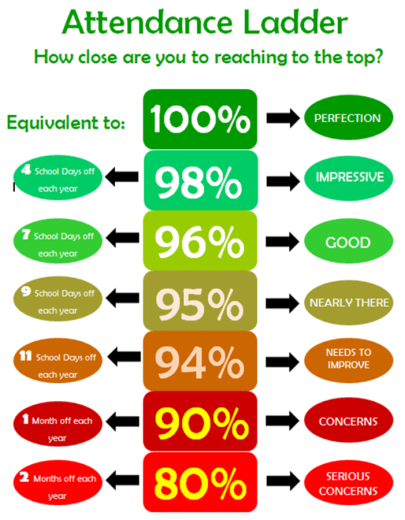 If you have any ideas about how we can improve further, then please do get in contact with me directly at the school. Many thanks for your support. It is invaluable.